It's the end of the world and I feel...nothing but anxiety. Thanks to Frank J. Barbiere and Christopher Peterson the apocalypse is approaching within hours and for the chosen ones they're safe. However, for Ellen Marlowe and her family she can't wait to board a transport off the planet fast enough. She just needs to get her paperwork in order, but there's something she's hiding. 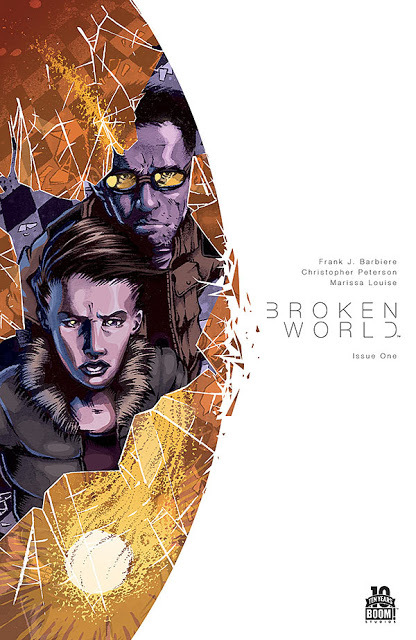 Broken World #1 is a fascinating twist in world extinction stories that will get you hooked. Marlowe is a college professor who's trying to keep it together for the sake of her remaining students who stick around for various reasons. Their views are a microcosm of society when the apathy and anxiety of the event take hold. Barbiere does a great job of establishing the conditions going on in the world with 48 hours left before the extinction level event happens. He slyly integrates television news reports to provide some exposition and set the stage for the final departure to a safe haven in space. It's like being on the VIP list at San Diego Comic-Con's Hall H panel. Except more people have been allowed to escape earth, about 75%, than those who actually get into Hall H.
The solicitation from Boom! Studios was on the mark when they compared it to Y: The Last Man and The Massive. It has that type of scope and tone. Barbiere offers up some great character development with Ellen and her family. A doting husband who's reassuring and confident about getting on the transport and a curious and naive child. We want them to escape yet Ellen's secretive issues could be a cause for concern eliciting some anxiety and unease near the end. Peterson paints a broad cinematic canvas to demonstrate the world has been mostly abandoned except by those who were not worthy to join the others. The desolate streets and those littered with protesters decrying unjust exclusion. And most of all the people crying out along the fence that leads to the transport terminal conveys the desperate and angry mood of those left behind. At times understated and economical, Peterson's layouts tell a story that compliments Barbiere's words. Just when you think you have 'Broken World' figured out Barbiere pulls quite the cliffhanger.The move opens up the storytelling possibilities going forward. It's an unexpected turn that helps reset the post-apocalyptic genre. With great character development and an intriguing premise 'Broken World' is a comic book worth adding to your pull list.